made for Stitched Up Festival in Wangaratta 2011 - a biennial textile festival for the north-east region of the state of Victoria, Australia. 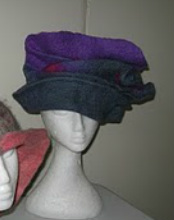 Went to Alice Springs Beanie Festival in 2009 and never came home! Whichever you call it, this is a neckpiece or vee-shaped scarf adorned (or is that embellished?) 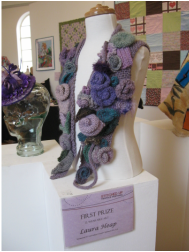 with knitted and crocheted flowers, leaves and vines. Made for Wangaratta Stitched Up Festival in 2011. Also went to Beaniefest in 2010.